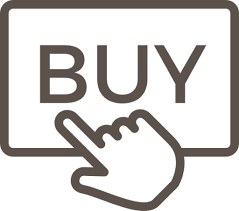 Browsing the web nowadays is not without showing unwanted advertisements and being tracked by advertisers. We all like to earn money but we should be able to have control over the things we want and the things we don’t want to see. Unubstructive browsing is what I call it. This is where tools like ADGUARD come in. 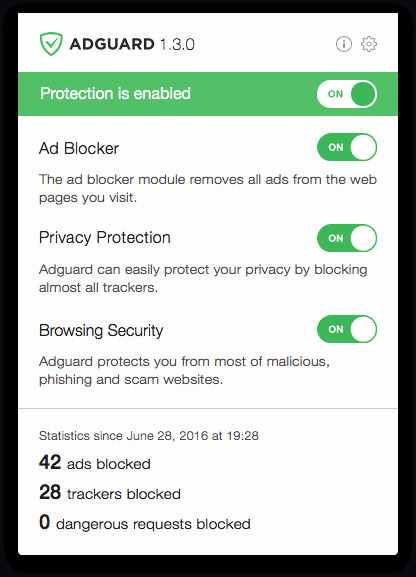 ADGUARD protects from trackers ( tracking is knowing all your searches and visits on the web ) and later confront you with advertisements in areas you might be interested in. 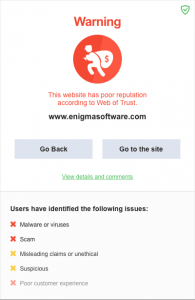 We do not want such behavior and applications like ADGUARD keep us a little in control. 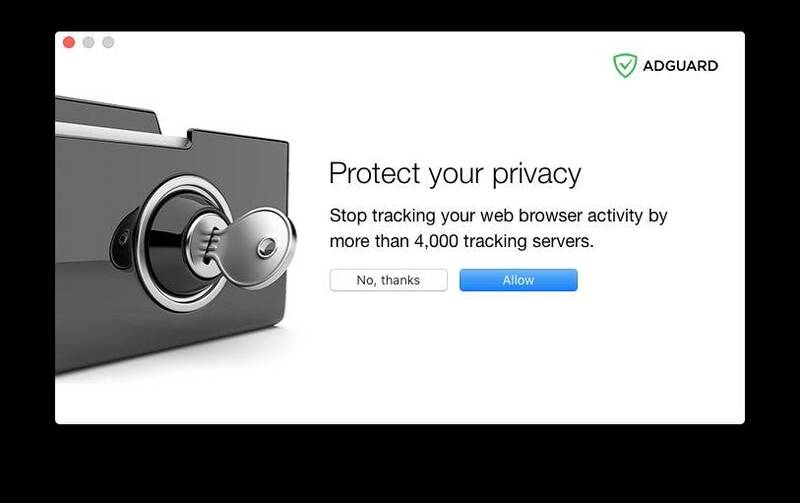 adblocker but adds ‘privacy and browsing security‘ as well. It works with all known browsers and also provides automatic internet traffic filters in addition to your firewall. ADGUARD is perfectly working with Safari and makes your internet browsing safer and provides extra pleasure without advertisements and pop ups. Mind you, some websites NEED pop ups to function, but that is for the user to find out and whitelist the related website. — Ad Blocker. Subtle filtering of all incoming traffic, and what is more, ads are blocked before they load to the page. — Browsing Security. Adguard checks every page for any malicious content using our databases, and blocks requests from potentially dangerous ones. — Privacy Protection. Any counters and tracking instruments will be blocked by powerful Spyware filter. 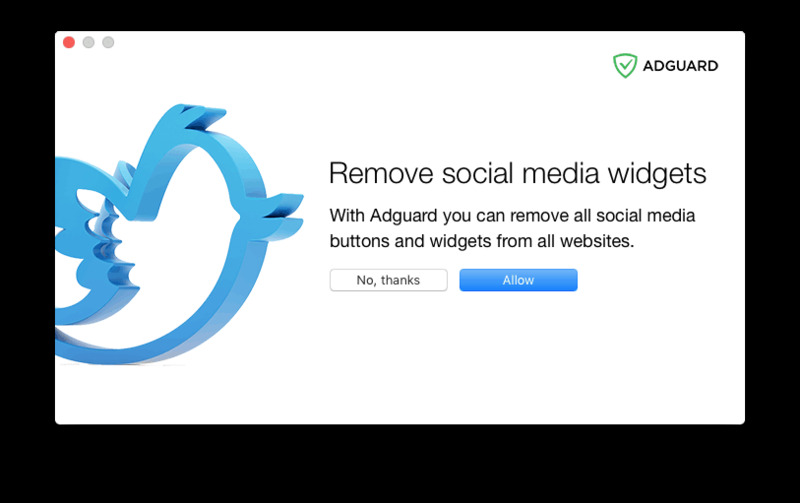 With Adguard you can stop worrying for the privacy of your actions on the Internet. One of the main functions of Adguard is filtering ads on websites. In this article, we will describe in details how exactly Adguard filters online advertising. Adguard’s work is based on the use of various advertising filters that define rules, based on which the program removes ads. Adguard may use a variety of different ad filters. We create some of them ourselves (you can learn more about it on this page), some of the filters are created by enthusiasts. Ad filtering mechanism depends on what product you use. Browser extensions rely on the capabilities that browsers provide them with. Adguard for Windows, Mac and Android works independently of your browser, using a completely different filtering algorithm. 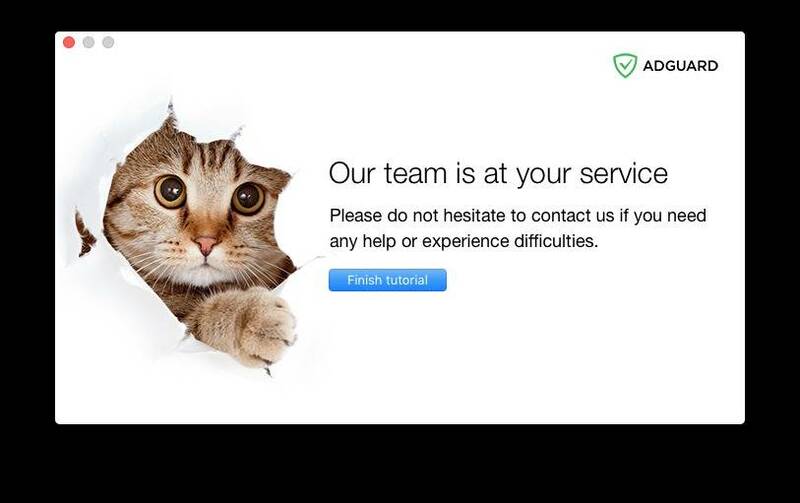 Below we describe all the stages of ad filtering that Adguard uses. Before a page is loaded into browser, Adguard processes its code removing elements according to the ad filtering rules. Thus browser does not recognize that there were actually those elements on this page and will not try to load them. Page code filtering technology is used only in Adguard for Windows, Mac or Android (if high quality filtering is enabled). That is because of the fact that capabilities of browser extensions are limited, and they can not change the page code before the browser processed it. Browser loads all the necessary elements on a page, defined by the page code. Based on filtering rules, Adguard can block the load of advertising elements, such as banners ads or Flash objects. This is an approach for browser extensions only. It is necessary, because the first step of processing (page code filtering) is unavailable to them. During post-processing, the browser extension removes all the elements, loading of which was blocked, from a web page. If we didn’t remove them, you would see not fully loaded elements, such as “broken” graphic. 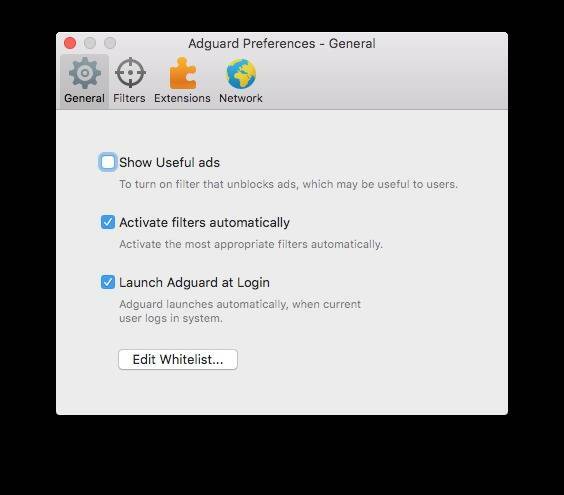 ADGUARD unlike all other ad-blockers is NOT an extension in the web browser but a standalone application, with its preferences located in the menubar. 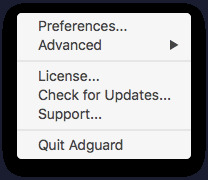 ADGUARD used to have some impact on your processor, but this latest version 1.3.0 has no or little processor use. 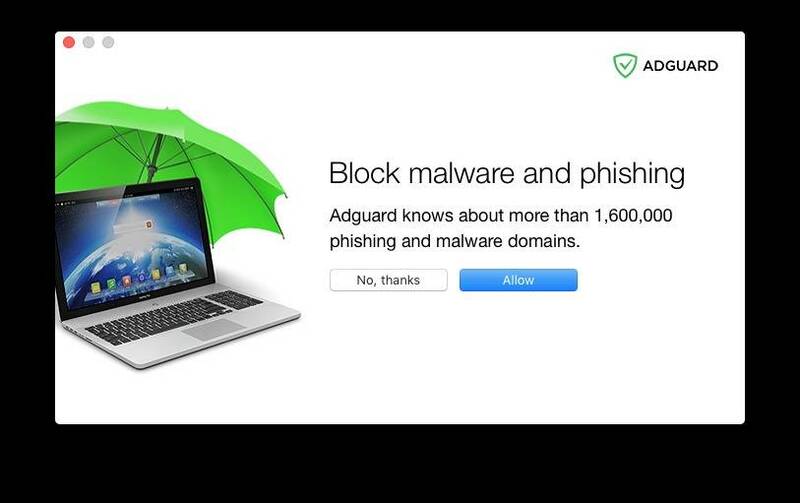 ADGUARD blocks adds and pop-ups unobstructive. There is no impact on speed browsing the web. ADGUARD provides Privacy and Browser Protection from most of malicious, phishing and scam websites. These features are a real bonus and justify the paid app compared to free alternatives. Another great feature of ADGUARD is the ‘ automatic filter of all internet traffic ‘ using the traffic interception module. This is a great addition to the standard firewall. Secure ( https ) connections are also filtered if selected. 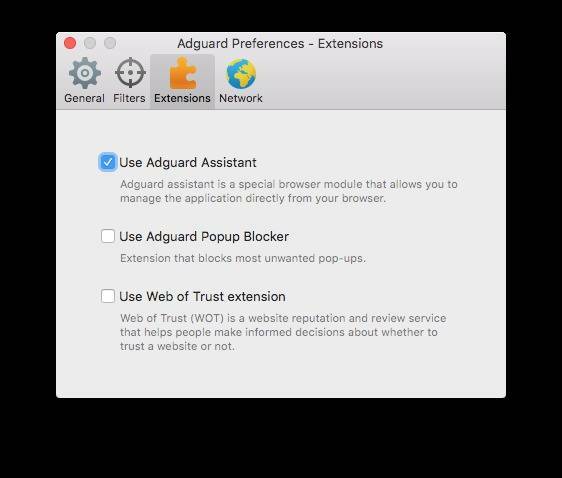 ADGUARD uses Web of Trust ( WOT ) information in order to make decisions wether a website is to trust or not. This information is updated regularly to maintain the level of protection. 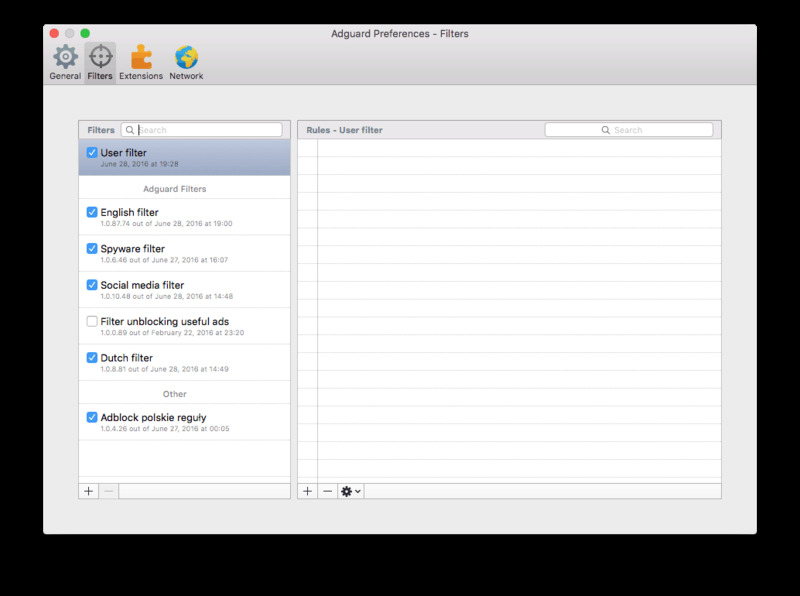 ADGUARD has the ability to add your own user filter, along with the other preset (spyware ) filters. The whitelist can be edited if needed, to grant a known website access. All in all, it works without any obstruction. 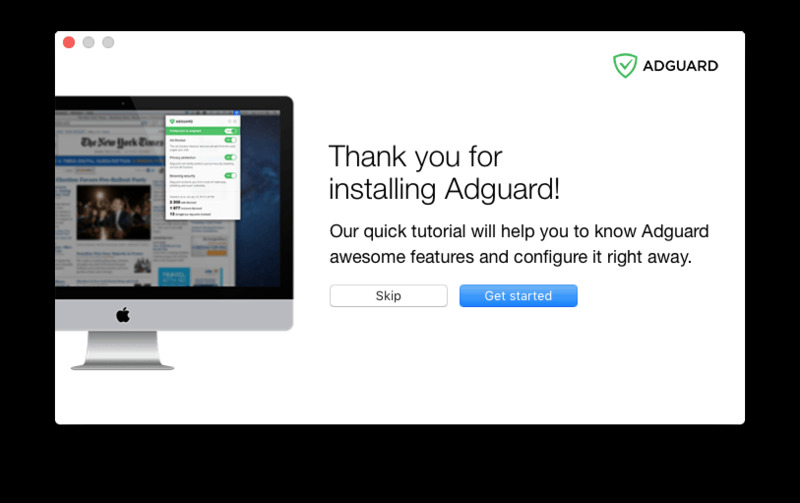 ADGUARD is not your average adblocker. This application has a mind of its own and sorts out he good from the bad. ADGUARD does provide safety and relaxed internet use. No more obstructive advertisements and pop ups, just plain and simple internet browsing . A pleasure to have it doing its job without any hassle. I recommend ADGUARD fully, if relaxed and safer browsing is your thing the price should be no deal breaker.